My excitement about the upcoming Captain America movie was obvious when I ordered this set of Captain America gel pens by InkWorks. In fact, I didn’t even care that they were technically made for the last Captain America movie, The Winter Soldier; I just wanted to inject a little Marvel into my day-to-day. 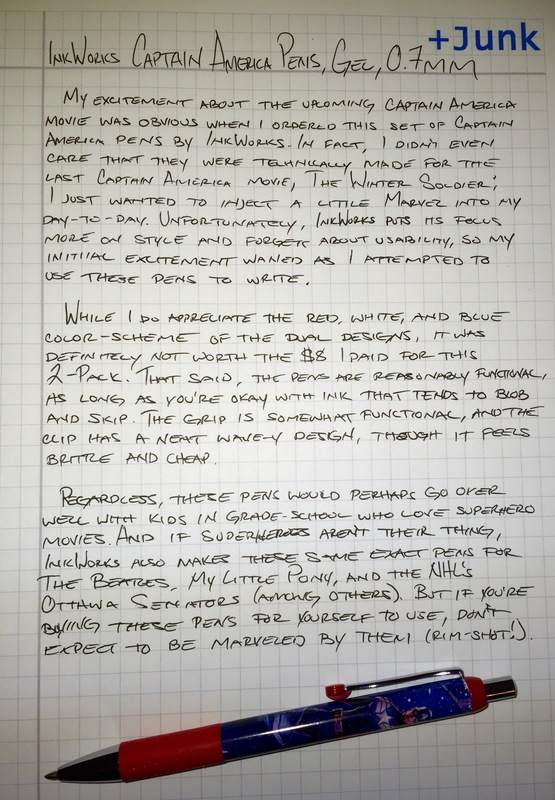 Unfortunately, InkWorks puts its focus on style and forgets about usability, so my initial excitement waned as I attempted use these pens to write. While I do appreciate the red, white, and blue color-scheme of the dual-designs, it was definitely not worth the $8 I paid for this 2-pack. That said, the pens are moderately functional, as long as you’re okay with ink that tends to blob and skip. The grip is somewhat comfortable, and the clip has a neat wave-y design, though it feels brittle and cheap. Regardless, these pens would perhaps go over well with kids in grade-school who love superhero movies. And if superheroes aren’t their thing, InkWorks also makes these same pens for The Beatles, My Little Pony, and the NHL’s Ottawa Senators (among others). But if you’re buying these pens for yourself to use, don’t expect to be marveled by them (ha ha! ).